We are now officially in the dog days of summer. Which is a weird saying! What does that even mean?! But, anyway, the days: they are dogs. It’s hot, the humidity is suffocating, and after a few minutes outside in the sun, you start to feel a little woozy. These are the kinds of days when you’re grateful to have a stockpile of icy cold treats in the freezer. 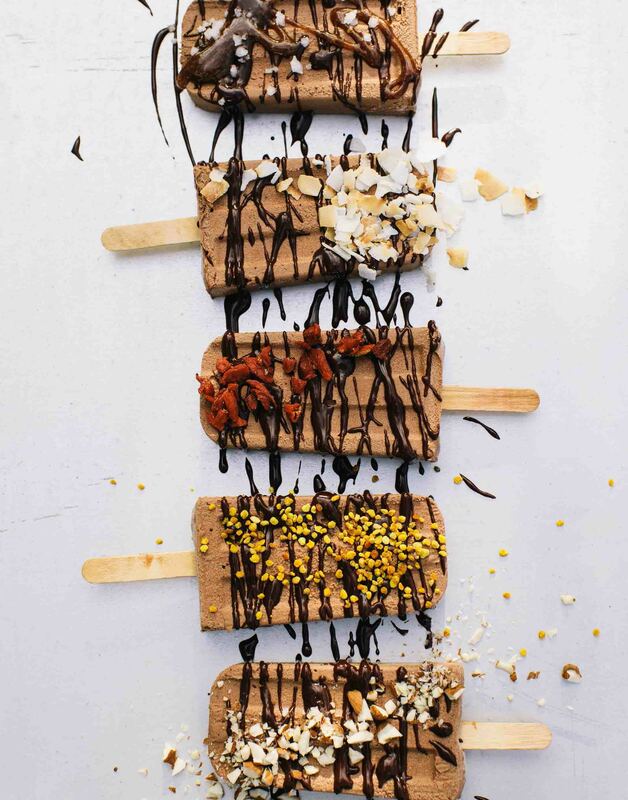 While I enjoy the occasional fruity popsicle, chocolatey treats are more my speed, so I am all about these vegan fudgesicles from Chocolate Every Day, the new cookbook from Bennett Coffey and Kyleen Keenan, founders of Not Your Sugar Mamas. Because I want to cool off on hot days, but I also want chocolate! The secret to making vegan fudgesicles with the same kind of chewy texture of the store-bought variety is to add healthy fats–specifically, a blend of coconut milk, coconut oil, and cacao butter, which all solidify when frozen. I am a total cookbook snob and I am completely enchanted by this one. I mean, even the title–Chocolate Every Day? Yes, please. This is my aesthetic. The concept is that chocolate can totally be an everyday food when it’s naturally sweetened, paired with other healthy ingredients, and plant-based. There are so many recipes in here that I’ve bookmarked, I don’t even know where to start. My 3-year-old is a fiend for horchata, so the Summer Chocolate Horchata is at the top of my list, but the Healthy Snickers, Pumpkin Cheesecake Bites, and Brownie Trifle with Caramelized Bananas are pretty high up there too. But back to the vegan fudgesicles–the best thing about making your own is that you can customize them by drizzling them with chocolate and sprinkling on your favorite toppings. Coconut flakes, pistachios, goji berries, and sea salt are suggested by the book, but I think I’m going to try hemp hearts too. Grab the recipe below and purchase Chocolate Every Day: 85+ Plant-Based Recipes for Cacao Treats That Support Your Health and Well-Being on Amazon. Reprinted from Chocolate Every Day by arrangement with Avery, an imprint of Penguin Publishing Group, a division of Penguin Random House LLC. Copyright © 2018, Bennett Coffey and Kyleen Keenan. Add the coconut milk, soaked cashews, oil, cacao powder and butter, and maple syrup to a high-speed blender and puree until completely smooth. Pour the mixture into ten 2.75-ounce popsicle molds and freeze until firm, about 4 hours. Drizzle with the chocolate sauce and sprinkle with your desired toppings just before serving. In a small saucepan over low heat, combine 3/4 cup liquid sweetener (like maple syrup or coconut nectar) with 1/4 cup of water and cook until the mixture just starts to bubble, about 4 minutes. Whisk in 3/4 cup raw cacao powder until smooth. If desired, pour the heated mixture into a blender or use an immersion blender to puree the sauce until super smooth. Store in a jar or covered container in the refrigerator for up to 1 week. Reheat before using.